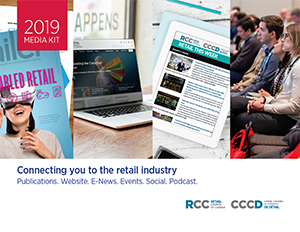 RCC offers both direct and custom marketing opportunities to reach our influential audience of RCC members, who represent over 90% of the country’s mid-large retail organizations as well as several hundred independent retailers. Build your brand and grow your retail client network. Sponsor, partner or advertise with Retail Council in our award-winning publications, events and media properties. We offer customized, cross-platform positioning to spotlight your business and showcase your thought leadership, industry insights and expertise to retail’s most influential decision makers. Canadian Retailer magazine: Published bi-monthly, both in print and online, this award-winning magazine is distributed to 50,000 readers. Both content sponsorship and advertising are available. Download the Canadian Retailer media kit. Retail This Week e-newsletter: This RCC-curated weekly e-newsletter is packed with retail’s top news stories and distributed to more 26,000 readers. Subscribe here to receive our newsletter. RCC Website: Our recently launched content-rich website offers several new placements for strategic messaging. Now available, limited opportunities: become the lead sponsor of a Community Hub. View our Community Hubs. DÉTAIL en bref e-newsletter (French): This French weekly eNewsletter features Québec-specific top stories and is distributed to more than a 1,000 readers in Québec. For more information, please contact Mary Markou, Director, Sponsorship & Partnerships at mmarkou@retailcouncil.org or 1-888-373-8245 ext. 236.